Lovely Loo’s ADA series is specifically designed to accommodate the unique needs of disabled users. 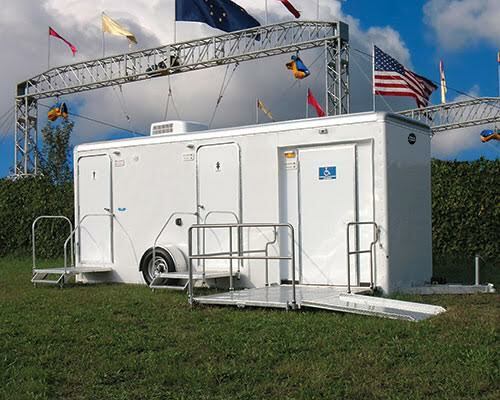 Our ADA units are not just ADA accessible, but ADA compliant, meeting or exceeding the permanent structure criteria as specified by the American’s with Disabilities Act. 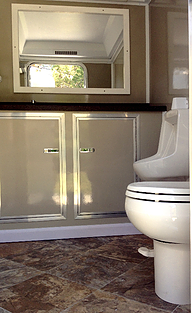 These trailer features 1 ADA Compliant Unisex bathroom and 2 additional standard private bathrooms. Each bathroom features a tan color scheme with warm tones that dress up the interior with a residential feel. Other key features include Corian counter tops, integrated sinks, simulated tile flooring with composite wood base trim and central ac or heat.